Our MERV 8 AC and Furnace Filters are a solid choice for most home and office use. Over 30-times more efficient at capturing micro particles than ordinary fiberglass filters! Our MERV 8 pleated AC and Furnace filters utilize 100% synthetic media which offers significantly higher particulate efficiency than regular poly/cotton media pleated filters, with little change in static pressure. 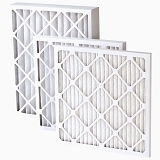 These filters capture airborne particles/allergens between 3-10 microns in size, such as particles that carry viruses and bacteria, pollen, dust mites, mold spores, fine dust and pet dander. Our MERV 8 filter media is naturally antibacterial and inhibits the growth of bacteria, mold, mildew, or fungi in normal operating environments, without being chemically treated. These MERV 8 pleated filters are an ideal upgrade from standard disposable fiberglass filters. Our air conditioner furnace filters do not allow the growth of mold or bacteria, keeping your home healthier. Our air conditioner furnace filters use permanently charged electrostatic material that helps dust cling to the air conditioner furnace filter.